British pop/rock singer, musician, songwriter, and actor. Born: 8 January 1947 in Brixton, London, England, UK. Died: 10 January 2016 in Manhattan, New York City, New York, USA (aged 69). Bowie is recognized as one of the most respected contemporary musicians of his period. Inducted into Rock And Roll Hall of Fame in 1996. Father to Duncan ZH Jones. For a list of all band and group involvement, please see David Robert Jones. this is not a complete album. it is a cheap at the time collection of live tracks from 'Stage'. There are so many vinyl Bowie releases after his death. It was totally understandable the year of Bowie's death, though still awesome in its extent. He's obviously one of our greatest artists and performers. And in the capitalist world, the reaction is More Product. Only the well-pocketed with a shed-load of storage can possibly keep up. Of course there was Black Star and its singles. Then presses and continual represses of important and recent albums. Lazarus the stage production and the complete Man Who Fell to Earth. The expensive and quirky 7" picture discs, unplayed by most (? ), one of them has a Starman price. Of course there is the completist's dream the 'five' year box sets. Wonderful items, though perhaps a bit of a tease for those who already have all the albums. Then other items, some of which are great to listen to. Bowie at the Beeb is a quality production and has some truly alternative takes. And other items, some of them 'rare', some simply odd: anthologies, live sets, collaborations, some 'strictly limited' . . . some unsellable before Bowies death. And some not even worth having? I wouldn't know - I don't have that big shed. My comment throughout this mania (not aimed at sellers) is think when you collect. In my opinion, real fans should be looking at the older items and perhaps even when Bowie was less popular. It helps when your taste is not populist *. There are some great items out there at cheap prices. Listen to it, choose carefully and enjoy it. Don't buy because it is Bowie. Buy it because you love Bowie. Sometimes when these current 'ltd editions' are issued they are not that limted at all (a ten thousand press run is not going to be a valuable collector's piece, unless it is Black Star). It is incredible the Bowie mania is still continuing (and being harvested). It won't continue. Those who bought because of the mania not the sound will eventually turn away and then prices will stabilise. 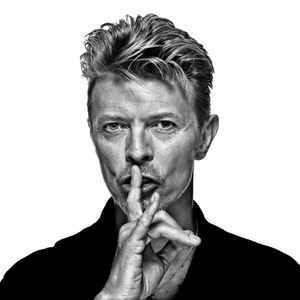 Another Star will die and Bowie will be only appreciated by his fans (perhaps a growing number?). Some items will remain precious because of their genuine relevance and rarity, many others will drop in price.
. . . and another black star . . .
* Let's face it: Bowie might have had fame firmly clutched in his grasp, but I think he looked at fame ironically and preferred individualism. I wonder how well fans take in that message. The album Outside is a good lesson. how can things like the k-tel/all saints compilation and rare be unofficial? Does anyone else agree that records,such as,Bowie/Elvis Space Oddity/Fool and the numerous others be in the Appearances section and not in Bowies own singles section ? Yes it is. But its value depends on many factors - number of copies, was it reprinted with correct title, was it withdrawn... No matter what it is, you should create release for your Cassette and in format choose and mark tag MISPRINT. Also, keep on mind under guidelines title of your misprinted cassette is added correct as on normal releases while misprinted title goes to Release Notes below credits. Would anyone know if a mis printed Pin Ups (Printed Pins Up) cassette is collectabile? Wow, cant believe how great the records on Bureau Supply are. Sound quality and packaging are amazing. why does 'Heroes' come before Low here at discogs? I still can't get over his passing. The only other artist that hit me this hard was Joe Strummer. Bowie was my very first rock star crush and the first album I ever bought was Hunky Dory. I was in 4th grade, 1982. I have been in love with him and his music ever since.